Summary: A multicultural family with young children spends a summer day interacting with each other, their community and the land on which they live. 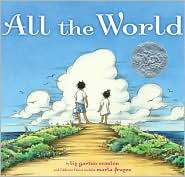 That’s the simple but it doesn’t do justice to this visually stunning book that was a 2010 Caldecott Honor Book for excellence in illustration in children’s books.. Literary elements at work in the story: The text in this book is a poem about the interconnectedness of the world and those that live in it. The text gets much of its power from the illustrations which accompany the text. The main characters of the poem – a multi-racial family – do not speak, but their illustrated activities juxtaposed against the poem, bring to mind a sense of the sacredness of every day activities. This is a perfect example of a picture book that is dependent on the pictures to bring the text to life. How does the perspective on gender/race/culture/economics/ability make a difference to the story? The family seen on every page is a multi-racial family, and they move in and among a community of diverse people at various locations during the day. The community has a small town feel to it, but the themes of the book are not limited to those in that setting. Theology: God created the world and all that is in it and calls humankind to participate with joy and care in the life that we share with others on the earth. The world is both awe-inspiring in its vastness, and also the place where small, quiet acts of connectedness and joy take place. What is your favorite picture in this book? Why? What is your favorite thing to do on a summer day? Where are some places that you’ve visited that make you feel really happy? Were there special people who were there? Thank God for your special place and the people who shared a happy time with you. What kinds of things to people do together to make sure we share God’s hope and peace and love and trust in the world? This review was written by Ann Knox, graduate of PSCE and Director of the Instructional Resource Center at Union-PSCE.